The Instant is the third album by Abolitionist that I've been able to write about on this website. 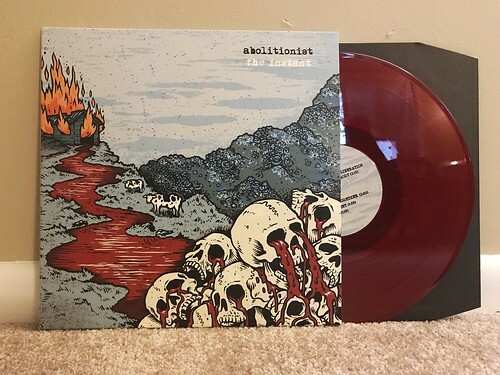 Over the years I've watched them start out as an exciting band that I hadn't heard of before to a group that I can count on to churn out a pretty strong record every time. I was a little concerned when the album starts off with the title track as the drumming is in full on gallop mode with the song careening by at a thousand miles an hour. But this is something of a false start as by the very next song, "Trouble," Abolitionist takes things down a notch and settles into a slightly slower and certainly more melodic pace for a good portion of this album. In fact I'd venture to say this is probably the album of their's with the least amount of blazing fast songs and I really think they benefit from that. There are plenty of fast, uptempo songs on The Instant, they just don't pass that speed limit where we start venturing into NOFX territory. Many times throughout the album I'm reminded of Dead Mechanical, primarily in the vocals, but also in the way that the bands construct their songs. They achieve maximum catchiness, but never sacrifice the underlying angst or pissed-off-ed-ness that are fueling the songs. All of their albums are solid, but The Instant may be the best of the bunch. Gleam Garden - S/T 10"
Broccoli - In Session 7"
Badge 714 - Tearless 7"
Rocket From The Crypt - Bootleg 12"
Character Actor - Out Of Hands 7"
Raging Nathans / Wonk Unit - Split 7"
The Practice - Punk Rock Needs Tragedy 7"